I think what Michelle Baddeley is trying to do with this book (or more likely the publisher with its positioning) is to recreate the success of Daniel Kahneman's Thinking Fast and Slow, and it may have been possible with this topic - but this is certainly not the book to do it. Various recommendations describe this as a 'tremendous read' and tell us that Baddeley has 'terrific writing skills' - but I have to be a contrarian: I found Copycats and Contrarians almost unreadable. The concept is simple - that there are two significant behaviours: going along with the herd and standing out and being different. Each has advantages in different circumstances, though it can be difficult to know if following the herd, for example, is a good or bad thing in a particular circumstance. 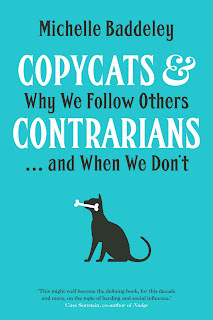 And, Baddeley suggests (contrary to David Sumpter in Outnumbered), our social media bubbles turn us too much to herd behaviour and keep out the contrarians who could change things for the better. All this sounds very interesting, and I think it could have been. However, there are three significant problems with the book. The first is that it sometimes feels more like a business book, with their typical approach of having a few points made over and over again, than it does a science book. Secondly it's very weak on narrative. When Baddeley does built in some kind of story - for example, describing a specific experiment - things pick up. But all too often what we get is just a collection of facts, theories and opinions. And, finally, what science there is tends not to be given enough of a detailed treatment. There is relatively little content with a proper scientific basis (even Freud gets a look in without real criticism) and where studies are mentioned there is nothing about, for example, whether the sample size is big enough to draw any significant conclusions. I came away from the book with very little insight beyond the second paragraph above. It just didn't work for me.